Kabaka Ronald Muwenda Mutebi II flagging off the runners at Lubiri. 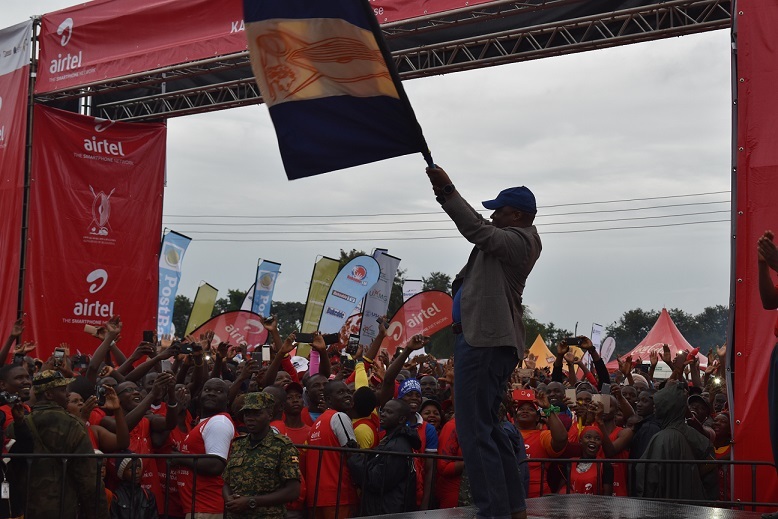 KAMPALA – Thousands have Sunday, April 7 morning turned up for the 2019 Kabaka Birthday Run at Lubiri, in Mengo. This was the 5th edition of its kind as the Kingdom moves to celebrate the 64th birthday of His Majesty the Kabaka Ronald Muwenda Mutebi II. This year’s run is aimed at creating awareness for the Sickle Cell disease in and outside the kingdom. Successfully back from 10km road run during Kabaka’s Birthday Run 2019. My new running shoes were a little tight but I’d a great experience. Glad to make my little contribution towards the fight against Sickle Cell Disease. 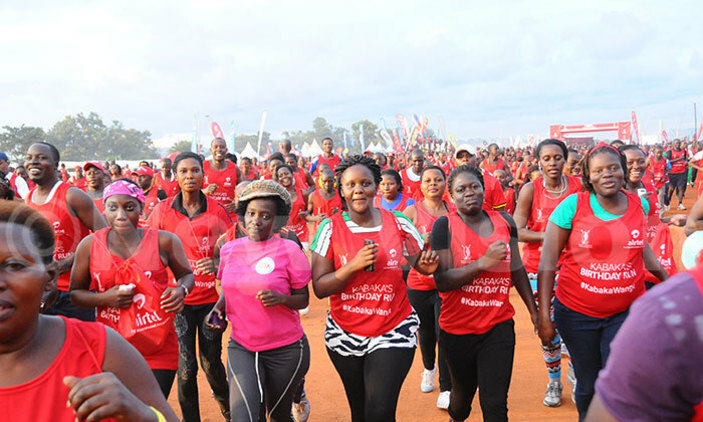 The much-attended event started at 5:00 am, when participants clad in red, a colour of Airtel Uganda, the official sponsor of the event started flocking the venue. By 6:50 AM, the chief guest and main reason for the run, Kabaka Ronald Muwenda II had arrived at the Lubiri before the national and Buganda anthems were played. Clad in a brown jacket, blue jeans and brown shoes, the Kabaka was received by the Buganda Prime minister Katikiro Owek Charles Peter Mayiga who was flanked by the sports minister Owek. Henry Ssekabembe Kiberu. The main sponsors Airtel Uganda were ably represented by the Managing Director V.G. Somasekhar and communications director Remmy Kisakye as they joined the Kabaka and other Kingdom subjects. As participants arrived, many limbered around in preparation for the run that had 5km, 10km and 21km categories. 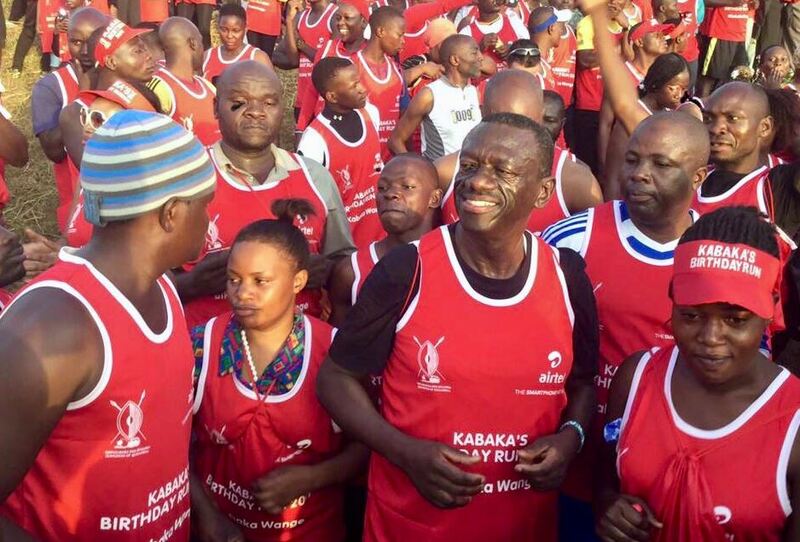 After taking part in the Kabaka’s birthday run on Sunday, former Forum for Democratic Change (FDC) president, Dr Kizza Besigye had this to say: “We are successfully back from a 10km road run during Kabaka’s Birthday Run 2019. The Airtel Kabaka Birthday run is one of the many celebrations to mark the 64th birthday of Kabaka Ronald Muwenda Mutebi II. The other activities will include volleyball which also climaxes on Sunday, April 7, 2019, at Lugogo show grounds parking grounds. Kabaka Mutebi will celebrate his birthday on April 13 2019.